Home › Investing › What Is The Betterment Minimum? What Is The Betterment Minimum? Betterment makes it easy to invest your savings in a diversified portfolio of stock and bond ETFs. As a leading robo-advisor, they offer all the bells and whistles you might expect, including tax-advantaged rebalancing, tax loss harvesting, financial goal setting tools via an intuitive online interface for low annual fees. Human advice accompanies the higher tier of service whereas the core service, Betterment Digital, is a purely automated investing solution. So, what are the Betterment minimum account sizes for each tier of service? For the basic service, Betterment Digital, no minimum account size is stipulated. You can take advantage of all the bells and whistles offered by Betterment without worrying about meeting a minimum threshold. The higher tier service, Betterment Premium, combines an automated investing solution with human advice. However, the higher touch nature of this service costs more to provide and so the account minimum is higher. The minimum account sizes for Betterment Premium is $100,000. Betterment Digital: Automated, digital portfolio management plus tax loss harvesting and tax-coordinated portfolio. Betterment Premium: All the services of Betterment Digital plus unlimited access to a team of licensed financial experts and CFP professionals, who actively monitor your accounts and provide financial advice during the year. Beyond the annual fees on managed assets, you will also have to pay expense ratios on funds held in account portfolios. It is standard practice for digital money managers and traditional financial advisors to pass on the charges imposed by funds, including ETFs, to clients. At Betterment, the investment expense ratios range from 0.09% to 0.17%, which are highly competitive in the industry. By choosing passively managed ETFs as opposed to actively managed mutual funds, which generally have higher operating costs, Betterment saves clients money. 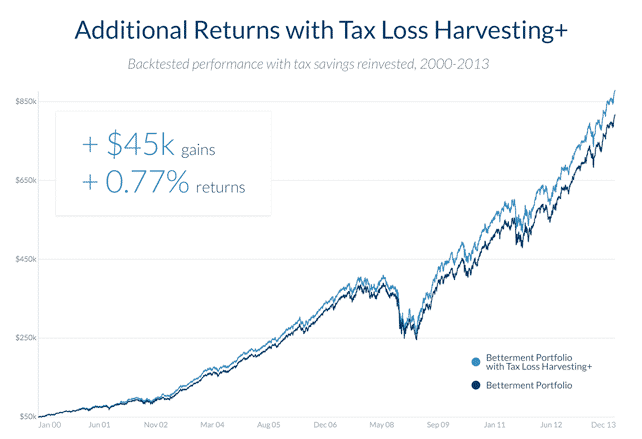 Betterment strives to keep costs low for clients not just via low expense ratios on ETFs and low management fees but also by looking to lower your taxes using tax loss harvesting, tax coordinated portfolios, TaxMin lot selling, and tax efficient ETFs. Tax loss harvesting is the process of selling a security that is losing money to offset the gains on another security that would otherwise lead to higher tax liabilities. The idea is when a security is sold at a loss, another correlated one is bought, so clients don’t lose out if prices rise, yet they still get to enjoy the benefits of lower tax bills. This is a good primer video on the method of tax loss harvesting that Betterment provides in all its service tiers. Betterment research claims that the process of tax loss harvesting can add tax alpha of up to 0.77% on average annually, which means the management fees charged by Betterment can potentially be fully covered. Tax loss harvesting is a way to boost after tax returns but it only applies to taxable accounts. For retirement accounts, such as an IRA or 401(k), tax loss harvesting doesn’t help because these qualified accounts already enjoy a tax-advantaged status. That’s where tax coordinated portfolios come into play. Betterment tax coordinated portfolios optimizes the strategy of asset allocation by placing assets that will be highly taxed into qualified retirement accounts that enjoy tax breaks and putting lower-taxed assets into taxable accounts. Betterment claims from historical studies that employing tax coordinated portfolios to optimize asset allocation can improve returns by an average 0.48% annually, resulting in a potential additional gain of up to 15% over 30 years. >> Related: What Is A Betterment Tax Coordinated Portfolio? Betterment uses a method called TaxMin Lot Selling to improve the tax impact (when compared to FIFO) of most transactions. When securities are sold, Betterment algorithms choose which lots to sell by following a set of rules which they call TaxMin. Before moving from one step to the next, all transactions are completed for a given category with higher cost basis lots getting sold first. Because smaller gains accompany higher cost basis holdings, a lower tax burden is felt by clients. For losses, the higher the basis, the larger the loss – which is helpful because it can offset gains. Take the following example that Betterment provides to highlight how TaxMin Lot Selling works. Let’s say you owned the lots shown below for a single security, and assume just 1 share in each lot. The purchase prices are listed so we’re going to fast forward to a time in the future when you want to sell one share. If the price of the security were $105, you would pay long term capital gains tax of $10 using FIFO. But with TaxMin Lot Selling, you would realize a short term loss of $16 instead. If you were to sell two shares, FIFO would result in a $5 long term gain while TaxMin Lot Selling would result in a $31 short term loss. So, while you do still pay taxes on your gains, the losses help to lower your tax bill. Many casual investors experience a tax surprise at the end of the year when investing in mutual funds, which are obligated to distribute capital gains to investors by year end – irrespective of when the mutual fund was purchased. These gains are not the same as capital gains, which shareholders realize when selling shares of the mutual fund. Theoretically, you could buy shares of a mutual fund in December and suffer from a tax distribution the next day. Unlike mutual funds, ETFs have similar tax efficiency advantages as index funds that do not generate internal capital gains from churning. Plus, ETF shares trade throughout the day – as opposed to mutual funds which exchange hands once per day at a Net Asset Value – which shields investors from accumulated capital gains within the fund. When you invest your money with a traditional financial advisor, or even if you choose to invest autonomously via a self-directed account, such as TastyWorks or TD Ameritrade, you will generally have some cash sitting idle in your account because you are only permitted to buy individual shares. But Betterment makes fractional share investing is possible, so 100% of your money may be invested to avoid a cash drag on your portfolio’s performance. Imagine you had $10 of cash uninvested in your Betterment Digital account, you could purchase 0.2 shares of a $50 ETF, which would otherwise be unavailable for purchase in a self-directed brokerage account. Betterment lets you sweep excess cash above a certain specified amount from your bank account into your Betterment accounts. Customer support is available 7 days a week by phone, email and live chat. We found employees to be knowledgeable, helpful and patient in answering a host of queries. If you have been around the block in the investing world, you have probably come across your fair share of unintuitive, hard-to-navigate online interfaces. At Betterment, you will find just the opposite. The experience is delightful because the interface is highly intuitive, simple to use and navigate, and lets you control and update accounts quickly and easily. Betterment offers a service called RetireGuide to construct a diversified portfolio designed to meet your retirement needs. Your personal retirement goals are examined and compared to your income, savings, location, and projected retirement spending. With RetireGuide, you can easily view your progress towards your retirement goals and receive nudges on how to realize your financial goals by saving or investing more. To learn more about Betterment, including what accounts types are available and the pros and cons of Betterment vs other robo advisors, check out our Betterment review. We would love to hear from you. What tips do you have to invest smarter? Share your feedback below. >> Which Robo Advisor Should You Choose: Betterment or Vanguard? ‹ What Are The Best Index Funds?